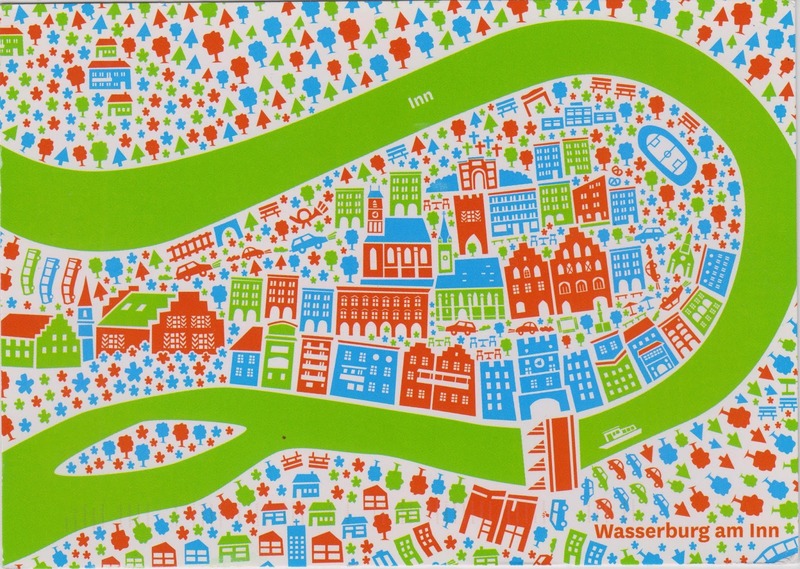 Postcard DE-3983228 from Germany shows a map of Wasserburg am Inn, a town of 12,000 in Rosenheim district in Upper Bavaria, Germany. Wasserburg am Inn is one of the most historic towns of Old Bavaria – somewhat older than Munich. It was claimed to be first mentioned in a document in 1137 while Munich first appeared in historical records in 1158. because it's location at the junction of the main overland route with the main water route, Wasserburg am Inn was the most important trade hub with the Balkans, Austria and Italy. Its bridge was the only crossing of the River Inn for 30 km in both directions. In the early days, salt produced in Berchtesgaden or in the Saline (saltern) at Bad Reichenhall was transported from there by cart to be loaded on ships travelling on the Inn River. The historic center is seen on a peninsula formed by the meandering Inn River. Many symbolized buildings on the map are Medieval structures that remain intact.